The Code Editor has a variety of features to help you take advantage of the Earth Engine API. View example scripts or save your own scripts on the Scripts tab. Query objects placed on the map with the Inspector tab. Display and chart numeric results using the Google Visualization API. Share a unique URL to your script with collaborators and friends with the Get Link button. Scripts you develop in the Code Editor are sent to Google for processing and the generated map tiles and/or messages are sent back for display in the Map and/or Console tab. All you need to run the Code Editor is a web browser (use Google Chrome for best results) and an internet connection. The following sections describe elements of the Earth Engine Code Editor in more detail. Above the code editor are buttons for running the script, saving the script, resetting the output map and console, and getting a link to the script. When the Get Link button is pressed, a unique link will appear in the browser’s address bar. This link represents the code in the editor at the time the button was pressed. The Scripts tab is next to the API Docs in the left panel of the Code Editor. The Scripts manager stores private, shared and example scripts in Git repositories hosted by Google. The repositories are arranged by access level, with your private scripts stored in a repository you own in the Owner folder: users/username/default. You (and only you) have access to the repositories in the Owner folder unless you share them with someone else. The repositories in the Writer folder are repositories for which write access has been granted to you by their owner. 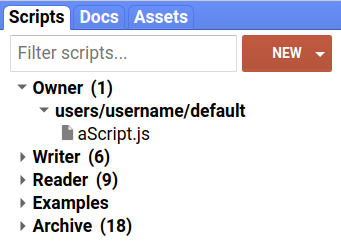 You can add new scripts to, modify existing scripts in, or change access to (you may not remove their owner) the repositories in the Writer folder. The repositories in the Reader folder are repositories for which read access has been granted to you by their owner. The Examples folder is a special repository managed by Google which contains code samples. The Archive folder contains legacy repositories to which you have access but have not yet been migrated by their owner from an older version of the Scripts manager. Search through your scripts using the filter bar at the top of the Scripts tab. Figure 2. The script manager. Click the button to create a new repository in the Owner folder or to create folders and files within a repository. You can rename scripts with the edit icon and delete them with the delete icon. You can move scripts and organize them into folders using drag and drop (Figure 2). If you drag a script to another repository, it gets copied. All scripts and repositories maintain full version history. Click on the history icon next to a script or repository to compare or revert it to an older version. To delete a repository, click the delete icon. To configure access to a repository, click the settings icon next to the repository name. Note that if you share a repository, the person with whom you're sharing will need to accept the repository by clicking the link shown in the settings dialog. Repositories can be accessed using Git, so you can manage and edit your scripts outside the Code Editor, or sync them with an external system like GitHub. (Learn more about Git from this tutorial). Click on the settings icon next to the repository name for instructions on cloning the repository. Note that you can browse the repositories to which you have access by going to earthengine.googlesource.com. For some Git operations, you may need to create authentication credentials by going to the Generate Password link at the top of the earthengine.googlesource.com page. The require function expects a string that describes the absolute path to the location of the module. Specifically, the argument of require() is of the form 'pathToRepository:pathToModuleScript'. You can only load modules from repositories that you own and/or have read access to. If you want others to be able to use your module, the repository must be shared with the other users you want to have access. The Asset Manager is in the Assets tab in the left panel. 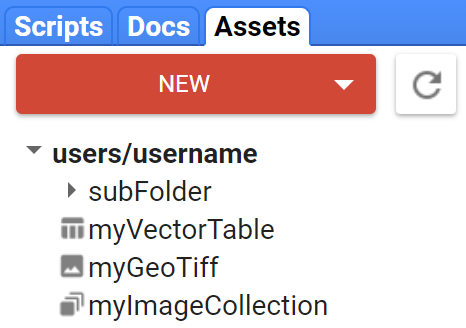 Use the Asset Manager (Figure 3) to upload and manage your own image assets in Earth Engine. See the Asset Manager page for details. Figure 3. The asset manager. To find datasets to use in your scripts, you can use the search tool for the data archive. The search tool is the text box at the top of the Code Editor that says 'Search places and datasets...' Type the name of a data product, sensor, or other keyword into the search bar and click the search button to see a list of matching places, raster and table datasets. Click on any raster or table result to see the description for that dataset in the archive. To import the dataset directly into your script, click the import link or the button from the dataset description. Figure 4. The imports section at the top of the code editor. The Map object in the API refers to the map display in the Code Editor. For example, Map.bounds() will return the geographic region visible in the Code Editor. Check the Map functions in the API to see other customizations for this display. Use the layer manager in the upper right corner of the map to adjust the display of layers you added to the map. Specifically, you can toggle the visibility of a layer or adjust its transparency with the slider. Click the settings icon to adjust visualization parameters for individual layers. 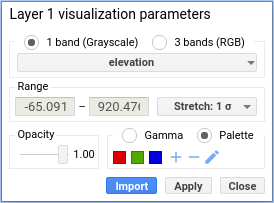 The visualization tool that appears (Figure 5) allows you to interactively configure layer display parameters. Click the button on the right of the tool (which performs a Custom stretch to the supplied min and max range by default) to linearly stretch the display to either percentiles or standard deviations of image values in the display window. Statistics are computed from all the pixels in the Map window at the current zoom level. Use the sliders to adjust gamma and/or transparency. Click the Palette radio button and specify a custom palette by adding colors (add), removing colors (remove) or manually entering a comma separated list of hex strings (edit). Click Apply to apply the visualization parameters to the current display. Click Import to load a visualization parameters object as a new variable in the imports section of your script. Figure 5. The layer visualization tool. Note that to the right of the layer manager are toggle buttons for different map backgrounds. Customize the background using Map.setStyle(). The Inspector tab next to the tasks manager lets you interactively query the map. When the Inspector tab is activated, the cursor becomes a crosshair which will display the location and layer values under the cursor when you click on the map. For example, Figure 6 shows the results of clicking on the map with in the Inspector tab. The cursor location and zoom level are displayed along with pixel values and a list of objects on the map. The objects list is interactive. To see more information, expand the objects in the Inspector tab. Figure 6. The Inspector tab shows information about the cursor location and the layer values under the cursor. When you print() something from your script, such as text, objects or charts, the result will be displayed in the Console. The console is interactive, so you can expand printed objects to get more details about them. 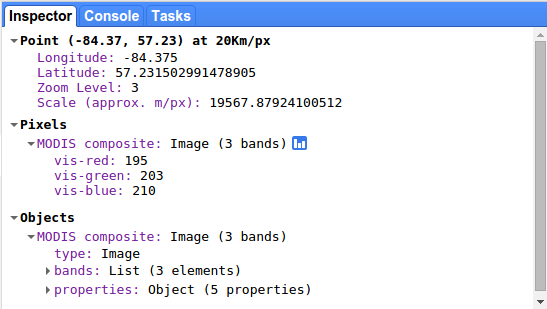 For long running tasks, use the Export object to perform large computations that result in an Image or FeatureCollection. Manage the exported tasks on the Exports tab. To start the export, click the run button next to the exported task in the Tasks tab. A configuration dialog will appear that allows you to choose the resolution or size for images, and the format (CSV, GeoJSON, KML or KMZ) for tables. Once you have run the task, hovering over the task in the task manager will show a ‘?’ icon which you can use to check the task status. To cancel a task, click on the spinning icon next to the task to cancel it. The profiler displays information about the resources (CPU time, memory) consumed by specific algorithms and other parts of a computation. This helps to diagnose why a script is running slowly or failing due to memory limits. To use the profiler, click the Run with profiler option in the dropdown on the Run button. As a shortcut, hold down Alt (or Option on Mac) and click Run, or press Ctrl+Alt+Enter. This activates a Profiler tab on the right side of the code editor. As the script runs, the Profiler tab will display a table of resource usage from the script. Clicking the Run button (without profiling) will make the Profiler tab disappear and disable the profiler. A textual description of the computation, algorithm, asset load or overhead operation being profiled. An indicator proportional to the number of times the operation described in 'Description' was invoked. An indicator of CPU time taken by the operation(s). This column appears only if there was an error because the script used too much memory. It shows the amount of memory in use on any single compute node at the moment the error occurred. Maximum memory used on any single compute node for the operation. Using any of the drawing tools will automatically create a new geometry layer and add an import for that layer to the Imports section. To add geometries to a new layer, hover on the Geometry Imports in the map display and click the +new layer link. 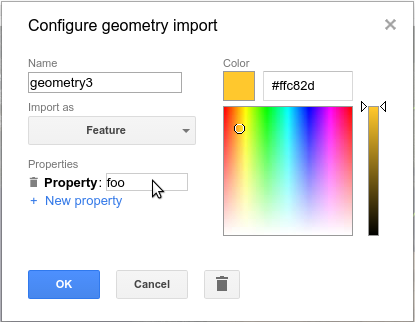 You can also toggle visibility of the geometries from the Geometry Imports section. Note that drawn geometries are geodesic by default, except for rectangles, which are planar only. Use the Geometry constructor to convert them to planar geometries. Learn more about geometries in Earth Engine on the Geometry page. Figure 7. The geometry drawing tools are in the upper left corner of the map display. To configure the way geometries are imported to your script, click the settings icon next to the layer in the Geometry Imports section on the map or in the Imports section of the code editor. The geometry layer settings tool will be displayed in a dialog box which should look something like Figure 8. Note that you can import the drawn shapes as geometries, features or feature collections. The geometry import settings also allow you to change the color with which the layer is displayed, add properties to the layer (if it is imported as a Feature or FeatureCollection) or rename the layer. Figure 8. The geometry configuration tool. Click the Help button to see links to this Developer's Guide, the help forum, a guided tour of the Code Editor and a list of keyboard shortcuts that help with coding, running code, and displaying data on the Map.